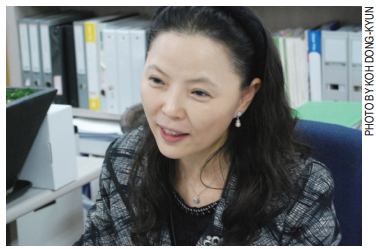 In October of 2016, Jang Hyeong- shim, a Professor of the Department of Education at Hanyang University(HYU) has been chosen as HYU’s monthly researcher. Her research was about the importance of learning immersion with the healthy learning attitudes. “Education experience gives a lot of possibilities to one’s life. I was especially curious about the various psychological phenomena in the situation of the education. Therefore, I naturally got interested in the study of education especially in the ‘Education Psychology’.” She said that she wanted to make a program and have a better understanding for the healthy learning process. For example, if the students are learning about ethics, many will feel bored even before the class, but if we approach ethics by a debate: “Ethical people are the evils of the society.”, the reactions of the students will be different. This type of approach is unusual to learn ethics in Korea where we study by memorization. Learned information through the debate will eventually become our own knowledge while memorized things are gone fast. This shows that although the same subject is taught, by differentiating the teaching methods, the efficiency perceived by the students varies. She wanted to find the most effective way to teach and apply it to the students.